Asia Cell is a subsidiary of Qatar Telecom Company. This is the first GSM-operator, which appeared on the mobile market in Iraq. Asia Cell is also one of the largest operators in the country, only slightly inferior to Zain in terms of the number of subscribers. The subscriber base of the cellular company has approximately 12.7 million people (39% of the mobile market). 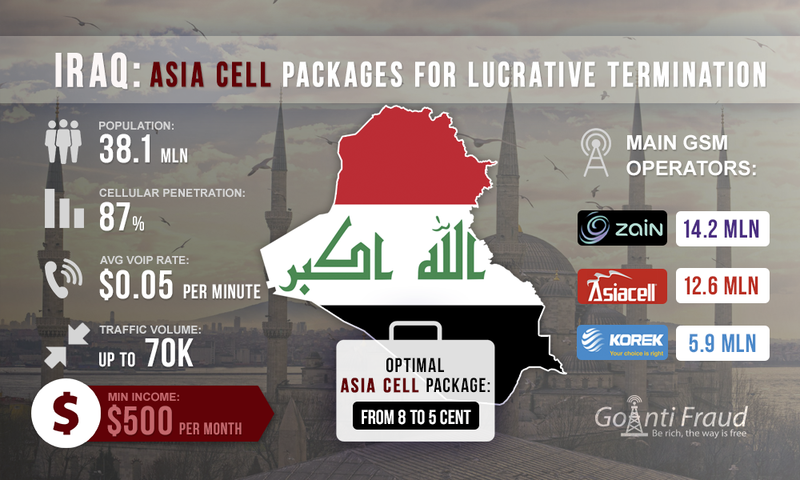 Many newcomers are interested in VoIP termination in Iraq via Asia Cell prepaid packages because a lot of international traffic gets through the operator. In addition, it provides 14 pre-paid packages - Zereen line, From 8 to 4 Cent, My Package, Youth Line, Almas Line, etc. The most suitable tariff plan is From 8 to 4 Cent in Al Sulaymaniyah. 1 Dinar Line, Gold Line, and Youth Line can be also used for the termination. However, the latter suggest competitive rates only for night calls. Complete NewBusiness solution from GoAntiFraud is your successful start into the GSM termination! We provide ready-business on a turnkey basis, which includes a set of equipment by GoIP, EjoinTech or ChinaSkyline, convenient software to computerize the operation and efficient tools to protect the SIM-cards from the lock. We also provide qualified technical support at every stage of your business. Our business model is based on the successful experience of more than 2,000 customers in 31 countries! When connected to From 8 to 4 Cent, one minute of conversation will cost as little as $0.00068 under the average load on the equipment. The tariff plan assumes obligatory top-up for $2.55. But it is worth considering that the package is valid only for the residents of Al-Sulaymaniyah, Ninewa, and Kirkuk. Therefore experienced terminators often install GoIP equipment in the above-mentioned areas. It also makes sense to use the Gold Line package, which provides a monthly advance payment in the amount of $2.55. At the same time, the cost of tariff plans for Youth Line and 1 Dinar Line will be cheaper. When you connect to Youth Line, you would have to pay $1.02 and $ 0.85 when connected to 1 Dinar Line. One minute of a night conversation, from 00.00 to 6.00, would cost as little as $0.0306. At an average cost of one VoIP minute about $0.05, the terminator can make about $500 a month, using a single channel equipment. And if you use a GOIP 8 gateway, the income will grow.